Showcasing a recent San Diego Contemporary Landscape transformation, Letz Design Landscape illustrates the collaboration between client and the designer. In this project, the client had specific requests for gabions (wire cages holding rock) large expanses of decomposed granite and a significant need for shade. The site is a side yard on a pie shaped lot at the end of a cul-de-sac overlooking a canyon near a busy freeway. Wind was a major factor in the design of the space and the plant selection. Further complicating the design and construction was a former pool on the site which had been filled in many years prior. In the construction phase, digging for footings did unearth portions of the former pool walls. Additional elements included a water feature cascade coming from one of the gabions into a pondless basin, built in seating and a large fire pit. The clients opted to add a built in bar-be-cue at a later time. Plantings were to be simplistic, provide screening and also some edibles in the form of both citrus and stone fruit (dwarf) trees. In the shade of the house, the client wanted a few tropical accents including Mexican Weeping Bamboo and bougainvillea ‘ooh la la’. 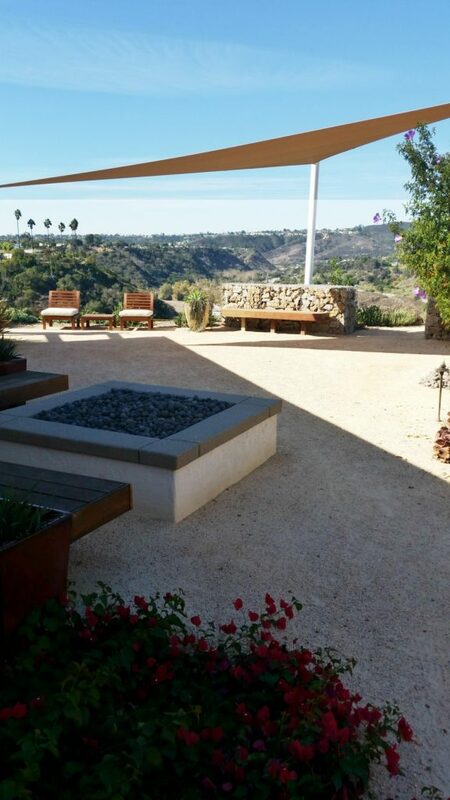 To add shade in such a wind-driven environment, a major shade sail from SoCal Shade Sails, with three metal post was installed over the center of the main open space of decomposed granite. To add a small wind break, one of the gabions was 48” tall with a built in wood bench next to it to provide some shelter from the prevailing west winds. 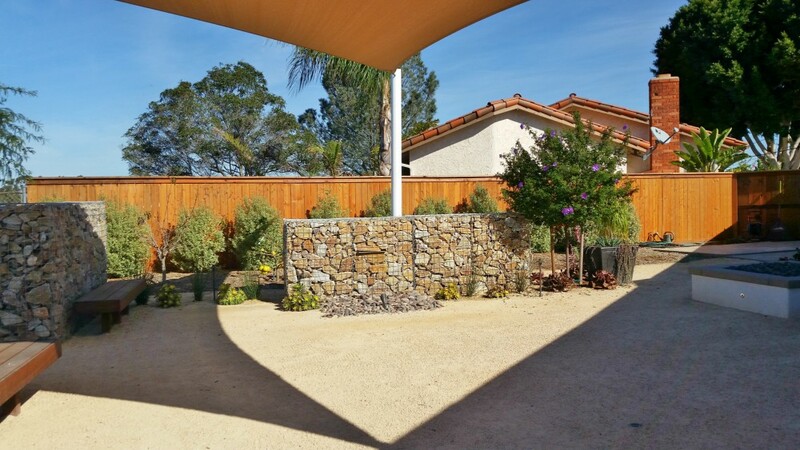 The combined gabions and shade sail do set a strong statement as a San Diego contemporary landscape transformation from the former wasteland of a yard space. Contact Letz Design Landscape for your future landscape transformation.